Dr. Debashish Chatterjee (Former Director IIM, Kozhikode) inaugurated the orientation ceremony for PGDM 2017-19 batch of Accurate Institute. Dr. Debashish Chatterjee gave a speech on his latest book "Invincible Arjuna". He related the qualities of famous Mahabharata character to today's top corporate managers. He guided students how being focused works well in corporate to achieve their objectives and to final success. Guest of Honor Mr. Rajesh Tripathi (Vice President GNCL Ltd.) told students about being practical in their daily life. He discussed many cases of his corporate lifestyle where new managers learn new skills to improve their efficiency and get themselves on competitive edge. He discussed about various types of popular jobs in the market and future jobs that would be coming for budding managers. Working in corporate for more than several decades Dr. D. V. Shastri shared his views and motivated students for having good values in life. He focused that today's youth can learn from holy religious books and grow in their career. According to him short cuts may work in quick progress but for lifetime there is no alternative than hard work. Motivational Speaker and well known for his speeches in India and abroad came to enlighten management students for their career and life. He discussed importance of attitude and techniques by which they can work on to improve their weaknesses. Lots of cases were discussed by him to show examples of corporate success. He demonstrated how a new student can become good communicator and grow in his career. Former Director of Kolkata , and Father of Modern CAT System with experience of more than 50 years he mesmerized the crowd by his thoughts and demonstrated how management as a career is the best alternative for the current generation. He stressed that students must be punctual in classes and work hard to achieve their daily targets so it would be easy for them to achieve long and tiring objectives of life. Corporate Trainer and personality development expert Mr. Bhanu Pratap Singh judged the students through his quick tests and instantly improved the weakness of communication in students. He asked students to volunteer for new initiatives and challenges. He told students about the benefits of sitting in front benches in classes. He showed how impossible looking tasks were achieved by today's managers and how they used their learning skills to get promotions in their career. Working as director for many institutions Dr. J. L. Raina made simple talks with students and using his humor showed that learning is essential for career and it should not be stopped in any part of life of a good manager. He discussed how simple techniques solves big problems and how corporate appreciate simple solutions to big problems. HE talked about thye importance of management to students and congratulated students for their selection in PGDM. Working in MNC for more than a decade and practicing Art of Living, Mr. Rahul Pandey made students practice lots of yoga techniques during the session. He discussed many examples how companies are making Yoga essential for their employees so everyone can have benefits from the traditional techniques. He discussed how managers can deal with stress using yoga and can have better health and benefits too. Working for many corporate Mr. Thothathri Raman discussed many issues related to learning and skill development. He stressed that students should learn regularly and should carry updated knowledge. He discussed about many corporate houses where hard working professionals are appreciated and given opportunities so they can prove their potential and grow in their life. UGCN Director guided management students how they can get jobs in good companies and progress in their career. His focus was more on preparation for the job. He guided how students can prepare themselves for company interviews. He discussed how a positive attitude works for a candidate going for interview. He discussed that in a few minutes time companies cannot judge the entire potential of a candidate but they can be sure about his attitude. He focused that students should work on studies and soft skills too. Joint Director ASSOCHAM, discussed finance subject related issues to students. He told how he was an average student and through his continuous development reached to the respected post of current company. He discussed details about SENSEX and financial sector companies and type of jobs in them. He told students what type of expectations a company has from new trainees. 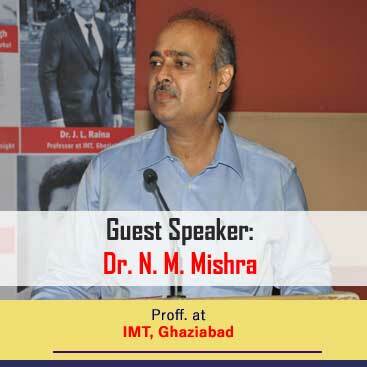 Mathematician and a well known business analyst Mr. N. M. Mishra expressed his views about the requirement of current industry in the field of research and analytics. He showed students his skills about MS Excel. He demonstrated some general cases of industry where they can use analytic tools and take better decisions. He asked students that they must practice analytical tools regularly to get proficiency in them. Corporate Trainer for personality development and English communication Ms. Soni Sharma came with lots of management games for management students. Whole day was reserved to make them aware about their strengths and weaknesses. Students learnt various focusing techniques and applied various organizational methods to achieve game objectives. She told how students can improve their communication skills and get benefits in corporate world.